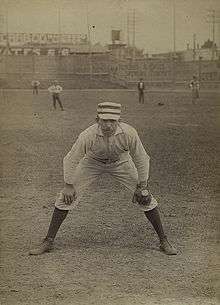 Arthur Albert Irwin (February 14, 1858 – July 16, 1921), nicknamed "Doc", "Sandy", "Cutrate" or "Foxy", was a Canadian-American shortstop and manager in Major League Baseball (MLB) during the late nineteenth century. He played regularly in the major leagues for eleven years, spending two of those seasons as a player-manager. He played on the 1884 Providence Grays team that won the first interleague series to decide the world champions of baseball. Irwin then served as a major league manager for several years. Arthur Irwin was born in 1858 in Toronto, Ontario, to an Irish blacksmith and a Canadian mother. As a child, he moved with his family to Boston and attended school there. He played local amateur baseball from 1873 until he was recruited by the Worcester Ruby Legs of the National Association in 1879. 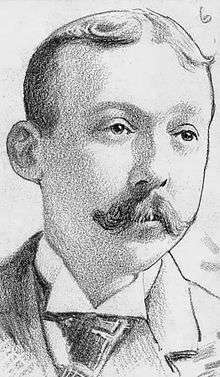 In late 1879, manager Frank Bancroft took Irwin and most of the other Worcester players on a baseball tour that included visits to New Orleans and Cuba. The team, which traveled under the name of the Hop Bitters, returned to the United States after only a few days due to financial and contractual difficulties. The team may have played as few as two games in Cuba. Irwin's major league career began when the Ruby Legs moved into the National League (NL) in 1880. He led the league in assists in his rookie season, and remained with the team through 1882, when it folded due to poor attendance. Irwin spent three seasons with the Providence Grays, and was captain and starting shortstop of the 1884 Providence team that became world champions. The 1884 Grays featured star pitchers Charles Radbourn and Charlie Sweeney; the two hurlers did not get along well, and Sweeney left the team in the middle of the season. The club folded after a fourth-place finish in 1885. Irwin coached at the University of Pennsylvania between 1893 and 1895, and he managed the Philadelphia major league club during those last two seasons. In 1894, he angered Penn supporters when a talented first baseman named Goeckle nearly signed with Irwin's major league team just prior to a series of collegiate championship games. Nonetheless, by 1895, Irwin's coaching role at Penn included the selection of players and other duties that traditionally fell to the team captain. Irwin left Philadelphia in 1896 to manage the New York Giants. Relieved of his duties after one season in New York, he was subsequently recruited to manage in Milwaukee. However, he returned to coach the minor league team in his native Toronto instead. ↑ "Arthur Irwin Stats". Baseball Almanac. Retrieved February 2, 2013. 1 2 "1989, Inductees: Arthur Irwin". Canadian Baseball Hall of Fame. Retrieved December 8, 2012. 1 2 3 4 5 6 7 8 Plummer, Kevin (April 7, 2012). "Historicist: Playing the Field". Torontoist. Retrieved September 4, 2014. ↑ McKenna, Brian. "SABR Baseball Biography Project: Doc Bushong". Society for American Baseball Research. Retrieved January 24, 2013. 1 2 "Arthur Irwin Statistics and History". Baseball-Reference.com. Retrieved December 23, 2012. ↑ Thoma, Edward. "Riding the Hoss". The Mankato Free Press. Retrieved December 24, 2012. ↑ "Pitcher Ferguson Dead". The Philadelphia Record. April 30, 1888. Retrieved December 24, 2012. ↑ "Dartmouth College". The New York Times. February 16, 1890. Retrieved December 24, 2012. 1 2 "Retrosheet: John Irwin". Retrosheet. Retrieved December 24, 2012. ↑ "Nepotism in Boston". Baltimore American. May 31, 1891. Retrieved December 24, 2012. ↑ "Phillies After Goeckle". The Philadelphia Record. May 3, 1894. Retrieved January 23, 2013. ↑ "Penn Baseball in the 19th Century: From Student Origins to University Administration". University of Pennsylvania University Archive. Retrieved December 24, 2012. ↑ "Irwin to Manage New-Yorks". The New York Times. October 30, 1895. Retrieved December 8, 2012. ↑ "To Engage Irwin". The Milwaukee Journal. August 28, 1896. Retrieved December 8, 2012. ↑ "Threatened With a Slander Suit". The Mail and Empire. May 4, 1898. Retrieved December 8, 2012. ↑ "Retrosheet: Arthur Irwin". Retrosheet. Retrieved December 9, 2012. 1 2 "Will Have Graduate Coach". Boston Evening Transcript. June 9, 1902. Retrieved December 24, 2012. ↑ "Retrosheet: Arthur Irwin". Retrosheet. Retrieved December 24, 2012. ↑ "Baseball Notes". The Pittsburg Press. July 8, 1907. Retrieved December 8, 2012. ↑ "Arthur Irwin to Coach Penn's Baseball Team". The Pittsburgh Press. January 29, 1908. Retrieved December 24, 2012. 1 2 "Digging Up Stars for Teams In Major Leagues No Snap". The Pittsburgh Gazette Times. June 2, 1912. Retrieved December 24, 2012. ↑ "Sign Stealing An Ancient Art in Majors". St. Petersburg Times. July 19, 1959. Retrieved December 8, 2012. ↑ "Arthur Irwin Promoted". The New York Times. December 6, 1912. Retrieved December 24, 2012. ↑ "Chance Quits as Yankees' Manager". The New York Times. September 13, 1914. Retrieved December 8, 2012. ↑ "American League News" (PDF). Sporting Life. February 6, 1915. Retrieved January 24, 2013. ↑ "1915 Lewiston Cupids Statistics". Baseball-Reference.com. Retrieved December 9, 2012. ↑ "Oscar Tuero Minor League Statistics & History". Baseball-Reference.com. Retrieved December 9, 2012. ↑ Thomas, Norman (June 5, 1943). "Baseball Veterans Remember the Cupids". Lewiston Evening Journal. Retrieved December 9, 2012. ↑ "Harvard Wants Pro. Coach". Evening Tribune. Oct 2, 1915. Retrieved December 24, 2012. ↑ "Harvard Baseball Coach". The New York Times. December 1, 1915. Retrieved December 24, 2012. ↑ "Irwin Cause of Ritter's Release". The Day. February 29, 1916. Retrieved January 23, 2013. ↑ "James Ritter". Sports Reference LLC. Retrieved January 23, 2013. ↑ Remington, Cray (May 22, 1923). "We Have With Us Today a Fine Thing to Do on Mr. Shaughnessy Also Ernest J. Lanigan". Rochester Evening Journal. Retrieved December 9, 2012. ↑ Taggart, Edward (March 24, 1942). "A Visit to Zip Sloan". Pittsburgh Post-Gazette. Retrieved December 8, 2012. ↑ Chellgren, Norton. "The Short Career of Lou Lewis". SABR Research Journals Archive. Society for American Baseball Research. Retrieved December 9, 2012. ↑ "Arthur Irwin Invented Glove". Trenton True American. June 16, 1909. Retrieved December 8, 2012. ↑ "Fielding Statistics and History: Arthur Irwin". Retrosheet. Retrieved December 9, 2012. ↑ Holroyd, Steve. "The First Professional Soccer League in the United States: The American League of Professional Football (1894)". USA Soccer History Archives. Retrieved February 2, 2013. ↑ "Outgeneraled Capt. Waters". The New York Times. November 27, 1893. Retrieved December 8, 2012. ↑ "Pennsylvania, 12; Tigers, 0". The New York Times. November 11, 1894. Retrieved December 8, 2012. ↑ "Kicks". The Daily Mail and Empire. October 18, 1895. Retrieved December 24, 2012. ↑ "Arrangements for Army-Navy Game". The New York Times. November 25, 1915. Retrieved December 8, 2012. ↑ "A Few Minutes With the News: Baseball". Baltimore American. March 31, 1900. Retrieved December 9, 2012. ↑ "News of the Cyclers". Mansfield Daily Shield. July 1, 1902. Retrieved December 8, 2012. ↑ "Plans to Build Another Bowl". Baltimore American. April 25, 1902. Retrieved December 24, 2012. ↑ "Arthur Irwin Lost on Ship to Boston". The New York Times. July 17, 1921. Retrieved December 8, 2012. 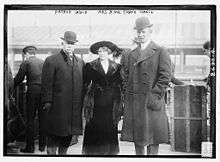 1 2 3 "Arthur Irwin, Famous Old Baseball Star, Leaves Two Widows and Two Families". The Pittsburgh Press. July 21, 1921. Retrieved December 8, 2012. ↑ "Arthur Irwin, Noted Old Baseball Star, Vanishes From Ship". The Pittsburgh Press. July 16, 1921. Retrieved December 8, 2012. ↑ "Irwin's Double Life Bared by Suicide". The New York Times. July 21, 1921. Retrieved December 8, 2012.